Desert to Douala, an incredible sonic and cultural exploration—and PULO NDJ‘s debut album—, is here. Released on 29th March, in the project Nickodemus, Wonderwheel Recordings’ honcho, and DJ Buosis, founder of HAPE Collective, support four talented local musicians. Idriss was born in N’Djamena, he’s been playing the garaya since 1998. He is one of the founders of Pulo NDJ and a member of HAPE Collective. Samy aka Gari Boy, the first artist to join HAPE Collective in Chad, was born and raised in Cameroon and plays the drums, an instrument he mixes with makossa, soukous and afropop since his childhood. Stingo, the highlife and afrobeat soul of Pulo NDJ, decided to become a musician on a Sunday in Lomé and has taken part to many tours in Ivory Coast, Burkina Faso, Benin, Ghana and Nigeria. He moved to N’Djamena in 2010 and when he met Samy, he started playing with him. Wahlid started playing the xylophone, the bass and synths in church at age 13. Born in Adamaoua, in the north of Cameroon, he is a multi-instrumentalist and he writes most of Pulo NDJ’s melodies. By creating an unprecedented sonic hybrid, this entourage of artists celebrates, enhances and contaminates the continent’s rich musical tradition with contemporary electronic influences. 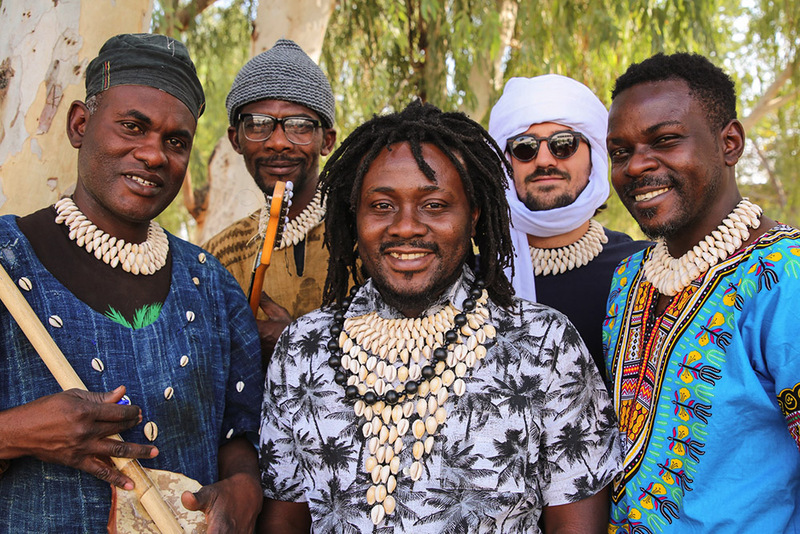 We interviewed DJ Buosis and the four members of PULO NDJ to learn more about them, about HAPE Collective and their work in Chad, and to find out more about Desert to Douala. 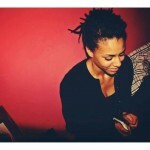 GRIOT: Tell us why, where and how HAPE Collective was born. 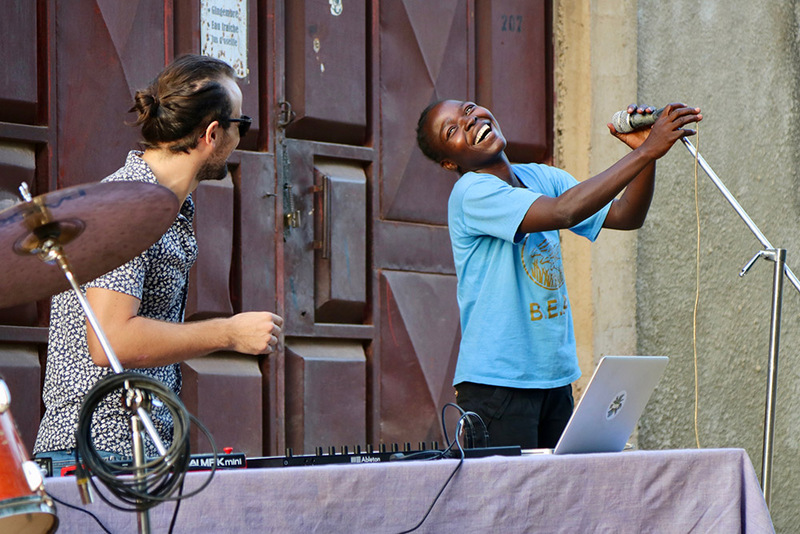 DJ Buosis: The HAPE Collective was born in Havana in 2016 in a historic moment for Cuba. Havana is a fundamental city in the Latin American landscape, which has always placed itself as a driving force behind new ideas often contrary to the dominant paradigm. I was there with some friends and we couldn’t just stand by and watch. 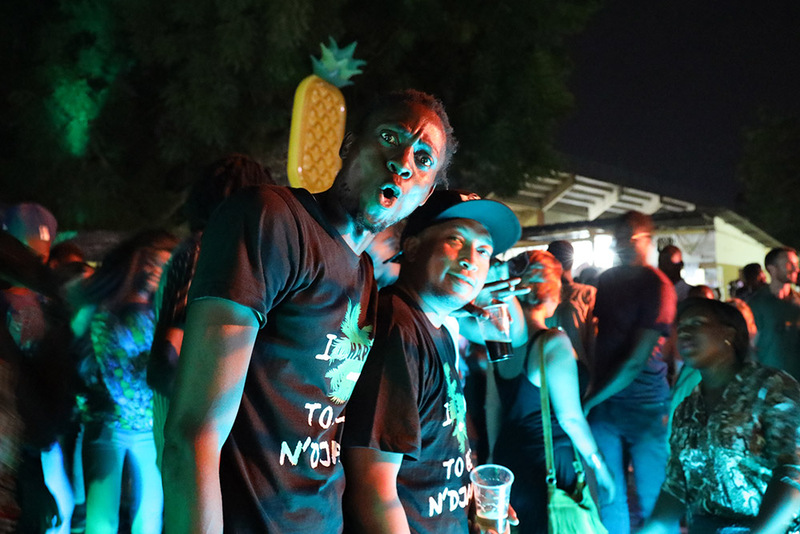 We have given our cultural contribution bringing new sounds and experimentations to the island. When and how did you decide to export it to Chad? How did it influence the collective? DJ Buosis: Chad was an accident, we can’t deny it. I followed love in N’Djamena and, in that arid city full of sand, I immediately met some people who were receptive to the proposal elaborated in Havana, as if they had the same thirst for experimentation of the Caribbean island, as if they had been looking for new stimuli to take them out of their comfort zone. The spirit of the collective started immediately and in a few months we started producing shows for six-seven hundred people, who would dance to traditional music mixed with electronic music. An unprecedented event for Chad’s capital city. How did the idea of ​​involving Nickodemus in the Desert to Douala project come about? DJ Buosis: Nickodemus is a guru at HAPE collective, as well as being a great friend and teacher. We invited him for the first time to Havana to play in one of our events and he immediately fell in love with the fusion, the melting pot that we were able to create. From there he followed us in Venice, for an event at Redentore, where I suggested he moved to N’Djamena to become a trainer in one of the courses we organise with the French Institute in Chad. When I sent him some demos that we had started recording with some artists from Cameroon and Chad, he immediately liked them. How did you come up with the idea of forming Pulo NDJ and how did all members come about? 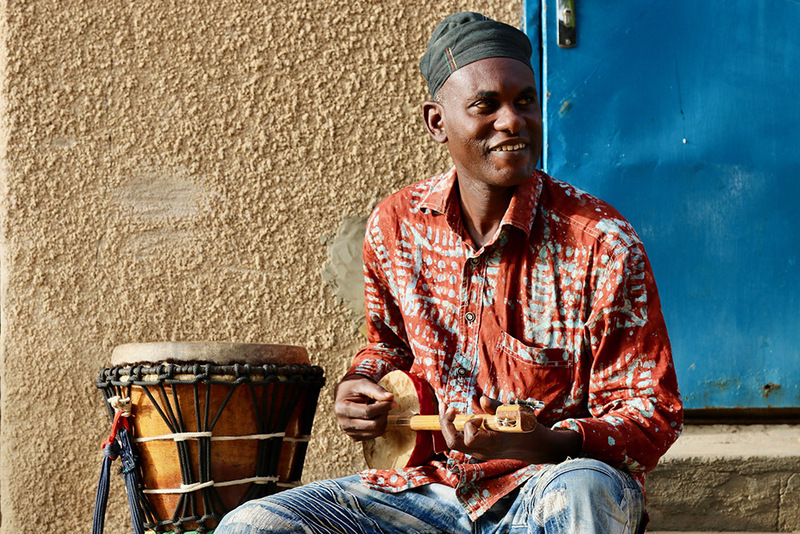 PULO NDJ: Right after the creation of the N’Djamena branch of HAPE Collective, a few people involved in the association began experimenting through jam sessions: a DJ spinning some tunes and one or more instruments with a modern and traditional character. These jams favoured the encounter between Pulo NDJ’s members. We can say that Pulo NDJ is the small research and creation lab for HAPE Collective, because all the members of Pulo NDJ are part of it too. Does the name PULO NDJ have a specific meaning? PULO NDJ: Pulo means Peul in Fulfulde language. Like them (the Fula people) we all left our birthplace to meet in N’Djamena. The Fula are a nomadic tribe who, in order to feed his cattle, organises a long and long transhumance. They are great walkers, and we are trying to develop the same ability in our compositions: move from a place to another and collect the best of both. With two of our members coming from this tribe, and having grown up in the greater Saharan zone, it was easier for us to claim this identity. How does Desert to Douala reflect Ciad’s current music scene? PULO NDJ: Desert to Douala combines the old and the new: it is a melting pot of traditional and modern songs and rhythms which are part of the sub regional musical universe of Central Africa. For example, one of Pulo NDJ’s member is Idriss who plays the garaya since 1998. He learnt how to build it by looking at the griots, the praise singers and storytellers who are the guardians of traditions, but today he plays the garaya on a disco beat made by Nickodemus. In general, we can say the album is in harmony with our traditions, and it dares to go further, into an unexplored territory that is fresh and attractive. We call it an uplifting diversity. What would you say the main characteristics of the scene are? 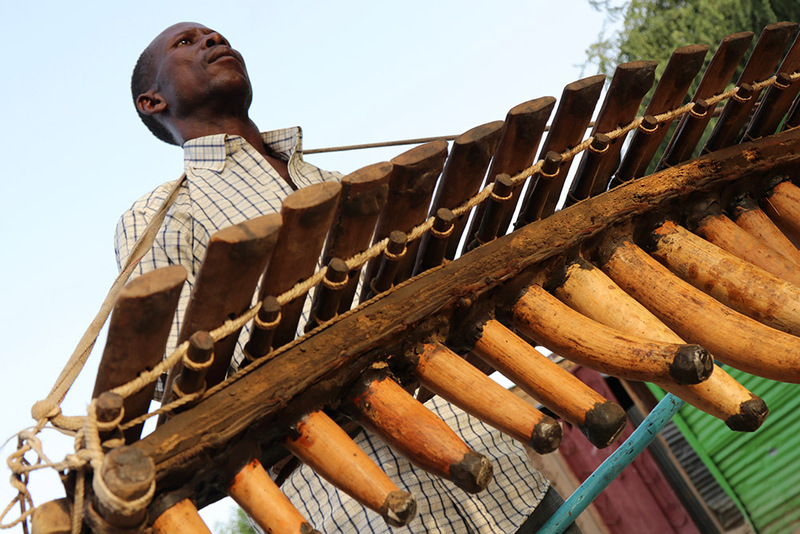 PULO NDJ: The rhythm, the dance, the twelve-minutes songs, the balafon and the tam tam, the writing of the lyrics are part of the everyday work of so many talented artists here in N’Djamena. What Pulo NDJ added to this was the fusion with the electro genre and a lot of variety in terms of rhythms and languages. This diversity is not only the product of our encounter, but it is also able to address different publics, coming from different part of this region, who can thus identify with the album. What is the role of HAPE Collective in N’Djamena? Has HAPE had an effect on the city, or was it the city that influenced and inspired the HAPE’s projects and ultimately Desert to Douala? PULO NDJ: All this experimentation was only imagined after the creation of HAPE Collective in Chad. HAPE enabled these trainings and meetings and thus allowed to highlight the many rich musical heritages that abound in Chad and the sub-region. The birth of Desert to Douala and the incomparable crowds gathering during the HAPE events can only confirm HAPE’s influence on the city. When will be able to see the group live in Europe? As soon as you wish, of course!